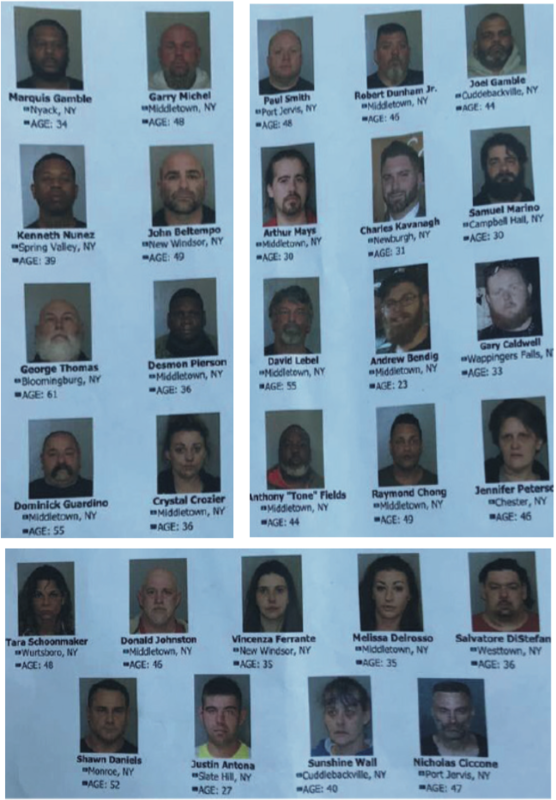 Spring Valley Police Department, the Orange County Sheriff’s office and the Town of Wallkill Police Depart- ment was charged with conspiracy and is alleged to have participated in the conspiracy to sell cocaine. On December 31, 2018, Kenneth Nunez, 39, of Spring Valley, was arrested and charged with criminal posses- sion of a controlled substance. A subsequent felony com- plaint charges him with conspiracy and it alleges that this cocaine had been given to him by Marquis Gamble to deliver to Paul Smith. Garry Michel, 48, of the Town of Wallkill, has been charged with crimes including operating as a major traf- ficker and is alleged to have been a “profiteer” in the conspiracy to sell narcotic pills, which were marketed to buyers as containing oxycodone, but which contained fentanyl. The pills were colored, stamped, and marked to appear to be oxycodone pills. He was additionally charged with conspiracy. Additionally, Sunshine Wall, age 40, of Cuddeback- ville, was charged with criminal possession of a con- trolled substance and Nicholas Ciccone, 47, of Port Jer- vis was charged with criminal impersonation and being a parole absconder.